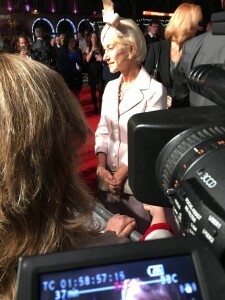 In October I was granted the honour of interviewing Dame Helen Mirren on the red carpet at the European premiere of TRUMBO, directed by Jay Roach. Bryan Cranston gave a cracking performance as Dalton Trumbo, the Hollywood screenwriter who was blacklisted after refusing to testify in the House Committee on Un-American Activities in 1947. Mirren is great in the role of Hedda Hopper, the infamous and nasty gossip columnist. Being one of the reporters on the carpet is sort of mad; desperately trying to get the movie stars to notice you and answer your questions. More than half of these reporters go home empty handed. Before I knew it, I was telling Helen Mirren that it was the first time Icelandic TV had a reporter on the red carpet for a film event of that scale. Her attention was caught, and I asked her whether she thinks films can influence people and send dangerous messages. BFI – London Film Festival is almost over. It’s been fantastic! I can’t decide which film is my favourite, but there are a few I love and some I thoroughly enjoyed watching. Suffragette is the film I’d been waiting for like a kid waits for Christmas. I wasn’t disappointed, it’s a really good movie and I loved it. Another film I loved is Carol by Todd Haynes with Cate Blanchett and Rooney Mara in the leading roles. It’s a brilliant movie. The Lady in the Van will perhaps be too theatrical for some viewers, but I loved it. Watching the fine acting of Dame Maggie Smith and Alex Jennings was a pleasure and I can say the same about Lily Tomlin, starring in that clever little film Grandma. She’s such a good actress and I enjoyed the film. Trumbo was good, not a perfect film but enjoyable. Great actors again, Bryan Cranston, Helen Mirren and John Goodman. Other films I’d like to recommend are; The Here After (Efterskalv) by Magnus von Horn, the documentaries Ingrid Bergman in Her Own Words and He Named me Malala and finally the dark and twisted Men & Chicken (Mænd & høns). Finally, here’s some interesting and entertaining words from the stars. Sorry about the bad quality of the recording. First up, Cate Blanchett reflecting on better roles for women in films. Dame Maggie Smith was asked if she’d gone method for the role of Miss Shepherd. Alan Bennett and Maggie Smith on ageing. Cate Blanchett was asked if she thought it would have mattered if Carol was made 5-10 years ago. This morning I had the pleasure of watching the film Suffragette by director Sarah Gavron, written by Abi Morgan. Suffragette is a drama that tracks the story of the foot soldiers of the early feminist movement, women who were forced underground to pursue a dangerous game of cat and mouse with an increasingly brutal State. These women were not primarily from the genteel educated classes, they were working women who had seen peaceful protest achieve nothing. Radicalized and turning to violence as the only route to change, they were willing to lose everything in their fight for equality – their jobs, their homes, their children and their lives. Maud was one such foot soldier. The story of her fight for dignity is as gripping and visceral as any thriller, it is also heart-breaking and inspirational. I thoroughly enjoyed the film and think it’s fantastic. The cast couldn’t be better; Carey Mulligan is captivating in the leading role of Maud Watts and all the other actors are brilliant. Suffragette is beautifully shot and the set design is perfect. I’ve read reviews by men saying they had difficulties connecting to the film emotionally. They claim that something is lacking in the storyline and the film is too feminist. I don’t understand those remarks and neither did three women I talked to after the press screening. We were all moved by the story and had tears in our eyes. Meryl also went on the New York Film Critics’ website and found that there were 37 men and only two women. Suffragette opens the BFI – London Film Festival 2015 tonight. 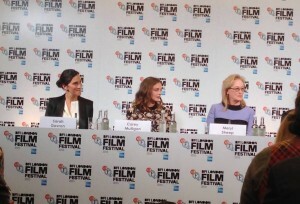 These days I’m attending the press screenings ahead of the BFI London Film Festival. The Icelandic film Virgin Mountain by Dagur Kári Gunnarsson is one of the movies that delegates from the press and the film industry got to see today. The film will be screened twice at the festival, on the 8th and the 10th of October. When the press screening of Virgin Mountain was over I was lucky enough to get three people from the audience to share their thoughts with me. 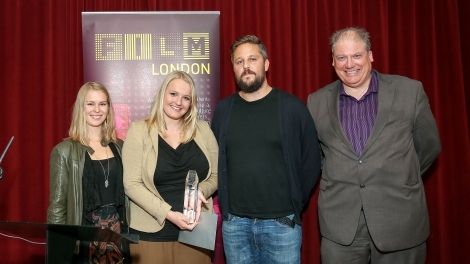 Yesterday, the Icelandic short Rainbow Party by Eva Sigurdardottir got the London Calling awards. London Calling. BFI. 10/9/2015. Photo from their website. 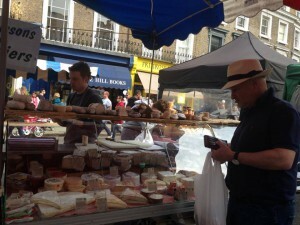 The film was produced with production funding from Film London, amongst others. Eva Sigurdardottir (director/writer/producer) and Ragnheidur Erlingsdottir (producer) attended the London event at the BFI. A selection of shorts will premiere at this year’s BFI London Film Festival on Thursday 15 and Saturday 17 October as part of the London Calling programme. 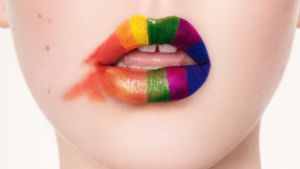 I can’t wait to see Rainbow Party at the festival. Eva’s production company, Askja Films, has many interesting projects in development, like the documentary The Hot Tub I told you about in June. ‘Eva Sigurdardottir is a BAFTA nominated Film Producer who is based between Reykjavik, Iceland and London, England. Eva’s Producer credits include the BAFTA nominated short film Good Night (2012), as well as Red Reflections (2014), The Substitute (2014), and Foxes (2014). Eva also Line Produced the feature film Rams (2015) by Grímur Hákonarson which premiered at the Festival de Cannes in the Un Certain Regards section and won the prestigious award. Upcoming projects include the feature film Heartstone (dir: Guðmundur Arnar Guðmundsson) with Join Motion Pictures, which is due to shoot in the autumn of 2015. Short films in production include Salvation (dir: Thora Hilmarsdottir), the short documentary Hot Tub (dir: Harpa Fönn Sigurjónsdóttir) and Rainbow Party (dir: Eva Sigurdardottir). Eva is also currently developing a range of feature film projects with the directors that she nurtured through short films as well as with new talent. Text from the Askja Films website. Who is this Baltasar Kormakur? In a sunny and warm Italy the highly anticipated film Everest opened the Venice Film Festival yesterday. The last two films to open the festival were Gravity in 2013 and Birdman last year. 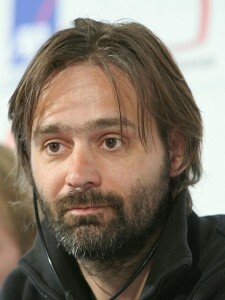 Everest is made by the only Icelandic director ever to make Hollywood blockbusters, Baltasar Kormakur. The film is based on a true story of a climbing expedition on Mt. Everest, that is devastated by a severe snow storm. The film has already gotten several reviews. Time Out praised the ‘astonishing’ craft of Kormakur’s 3-D spectacular and The Hollywood Reporter called the movie ‘gripping and immersive’. Peter Bradshaw from Guardian is not as content and says it’s a ‘thriller that’s light on thrills’. Variety and ScreenDaily have also published their reviews. Here are reviews from The Independent, Belfast Telegraph and The Irish Times. Kormakur is born on the 27th of February to an Icelandic mother, Kristjana Samper, and a Spanish father, Baltasar Samper, both respected artists in Iceland. Baltasar Kormakur started out as an actor and became well-known at a young age, but found passion in directing early on and has since staged plays, directed films and has recently added TV to the equation. Furthermore, he is a very productive producer. You can read about his body of work here and I personally recommend this interview and this one. Then there are trailers for some of his films. First up is 101 Reykjavik, his directorial debut. White Night Wedding is loosely based on the play Ivanov by Anton Chekhov. Baltasar also directed the play at the National Theatre of Iceland. The TV series Trapped, coming up soon. It’s interesting being a tourist in your own homeland. I’ve been surprisingly cold since I arrived in Iceland 10 days ago. Always wearing a coat, when other Icelanders wear t-shirts. I marvel the landscape and nature in new ways and enjoy every single drop of the fresh water, straight from the tap. I’ve been admiring how many good Icelandic designers there are and listening to marvellous new local music. There is no doubt about the fact that our talents lie in arts. Then there are times when I just don’t get my fellow Icelanders. For the longest time, it was impossible to get Icelanders to form a proper queue. They simply couldn’t bring themselves to stand in a line and wait for something. When people from other nations waited politely for their turn in a bank or at the bus stop, Icelanders would stand in some irregular blobs, pushing each other around. However, things have changed recently. 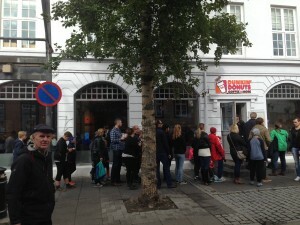 All of a sudden, Icelanders seem to love waiting in queues. I think it’s their new hobby. What else could possibly explain what I witnessed yesterday? The American global doughnut company Dunkin Donuts opened a shop (they actually call it a restaurant) here for the first time a few days ago. Yesterday, there was still a long line of people outside, waiting for their turn to buy a doughnut. 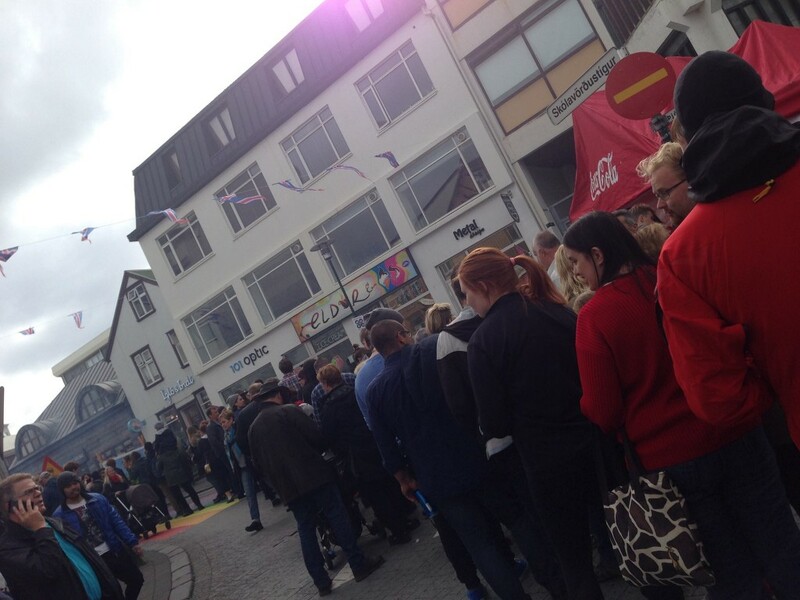 What made it extra weird was witnessing that queue merge with a never ending line of people waiting for a taste of bacon at the Bacon festival taking place on Skólavörðustígur across the street. London is the theatre capital of the world so it’s a privilege to live here for someone who loves to see new plays. 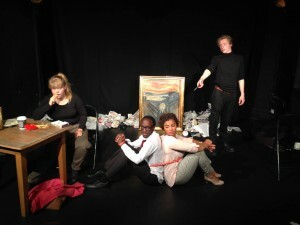 Last night I was lucky enough to witness a preview of a brand new comedy, The Lost Art of Lost Art. It’s a dark comedy about art theft, inspired by the past thefts of The Scream and the Mona Lisa. Molly and Lee think they’re masters of the craft. 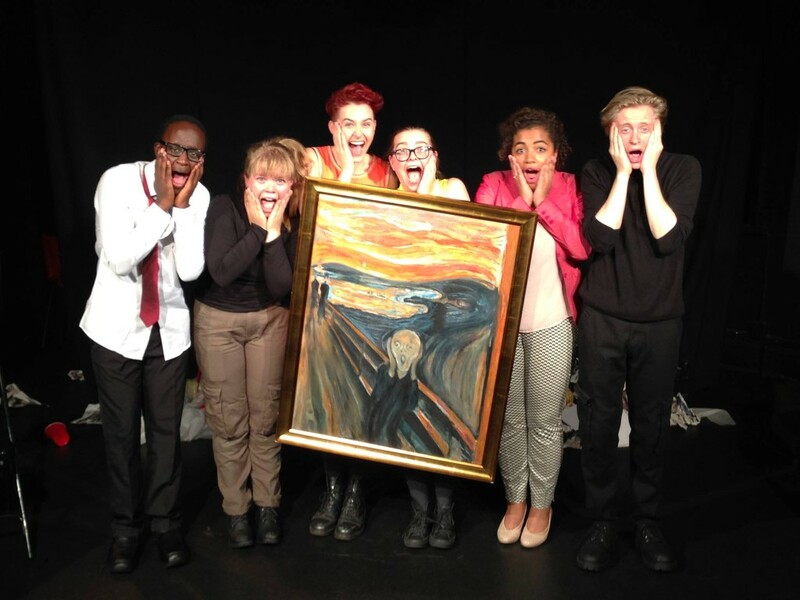 They’ve done the hard bit and ‘The Scream’ is hanging on their safe-house wall. It’s worth over £74million… if only they could sell it! The play asks questions like: How far would you go for money and is art nothing more than a price tag? Two of the talents are Icelandic. Álfrún Gísladóttir produces and also plays one of the thieves, and Sara Hjördís Blöndal is the set and costume designer and also manages the stage. The production is the winner of the 2015 Scottish Daily Mail Award and is on its way to the Edinburgh Fringe Festival. It’s directed by Lucy Atkinson, who was kind enough to talk to me before the show started. I asked her how she got involved. The show last night went really well. The writing is good, the tempo was spot on, visually it was genuinely convincing and there was a lot of laughter, so the audience obviously liked the comedy. I wish them well at Edinburgh and I can’t wait to see what the future holds for those talented and clever kids. 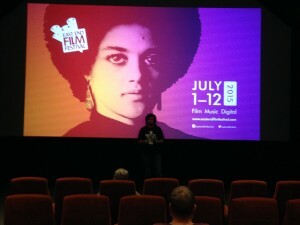 When the sun is shining bright, on one of the most beautiful Saturdays of the summer, going to a Film Festival is perhaps not what most people choose to do. Let alone to watch a pretty bleak Nordic film. A few film enthusiasts did so anyway to watch Baldvin Zophoniasson’s second feature, Life in a Fishbowl at the East End Film Festival. The film follows three very different characters offering a cross section of society after the financial crash in Iceland 2008. A kind-hearted single mother takes on a demeaning career to stay afloat and protect her child; a dishevelled drifter drinks in order to forget his past; and an ambitious businessman wrestles with his conscience in the face of corporate fraud. I talked to some audience members after the screening and they all liked the film. A few talked about how gripping it was and one said she wanted to marry Móri. Most of the people were eager to run out and bask in the sunshine but I managed to get an interview with Tim Evans, who was kind enough to sit down with me and share his thoughts on the film.